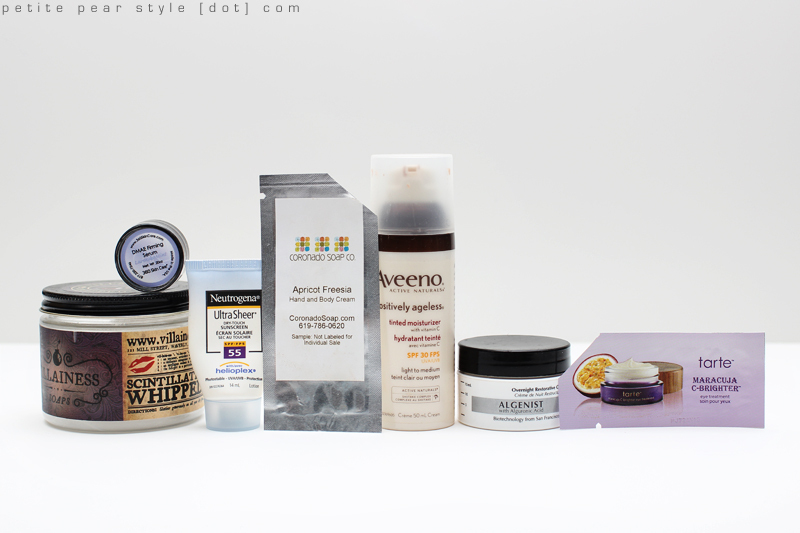 Thoughts: I have mixed feelings about these products. On the one hand, they actually do help to thicken my hair! However, they make my hair feel very dry, coarse, and straw-like. Source: Denyse from QueencessQuality sent this to me... thanks Denyse! Thoughts: I love this treatment! You have to leave it in your hair a long time (20 to 30 minutes), but it worked so well at making my hair super soft and silky. Thoughts: I liked the scent of this shampoo; however, the formulation did not work for me at all. It was horrible at cleaning my hair... my roots became greasy the next morning and seemed to stay that way despite using dry shampoo. Thoughts: I really like this conditioner - one of my favourites aside from deep treatments or masks! Source: Thank you to Lisa for sending this to me! 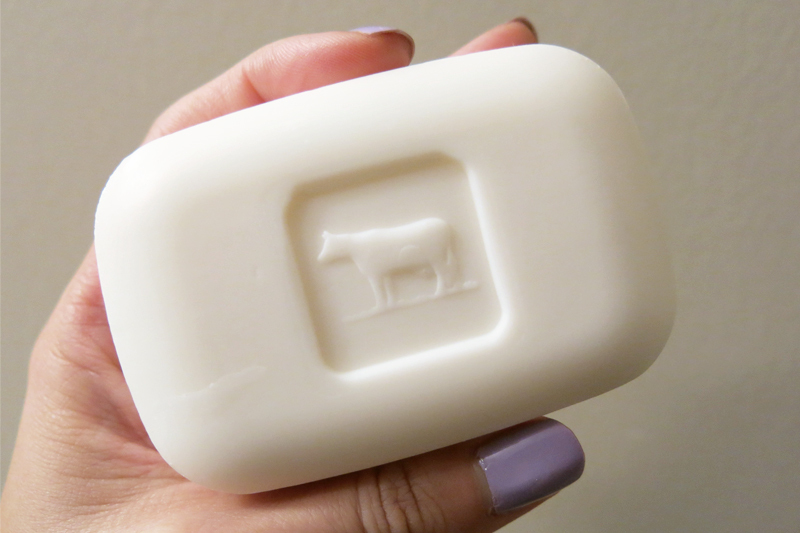 Thoughts: I loved this bar soap - the scent was a lovely floral with a hint of fruitiness. 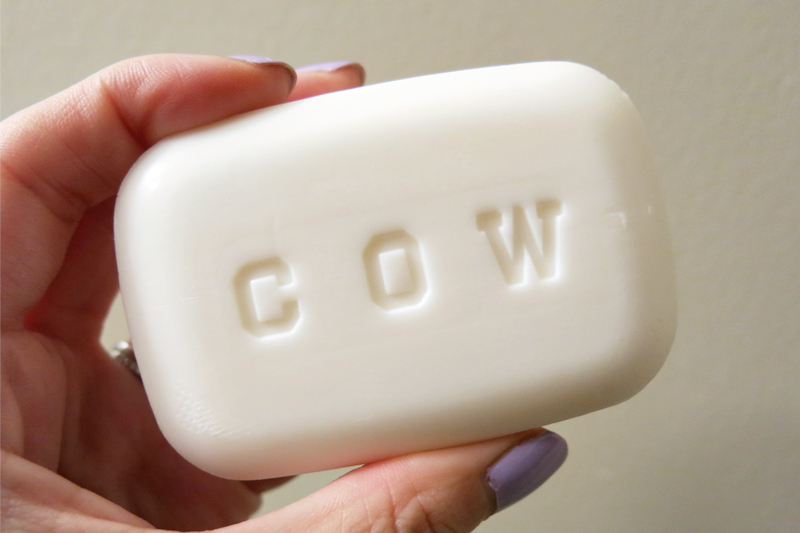 The lather was very soft and the beauty bar lasted a long time. I also loved the packaging. This soap is made in Japan. Thoughts: I love the Filthy Farmgirl line of soaps - they all lather so well and I absolutely love the artwork on the wrapper. This scent did not really do it for me though - it was a little too light. I checked the Filthy Farmgirl website and did not see this "flavor" so it's either discontinued or only available in Hawaii. Thoughts: This is one of my favourite scents ever! Unfortunately, I didn't enjoy using this product because it stung all my little wounds that I didn't know I had. I don't really like salt scrubs for this reason. 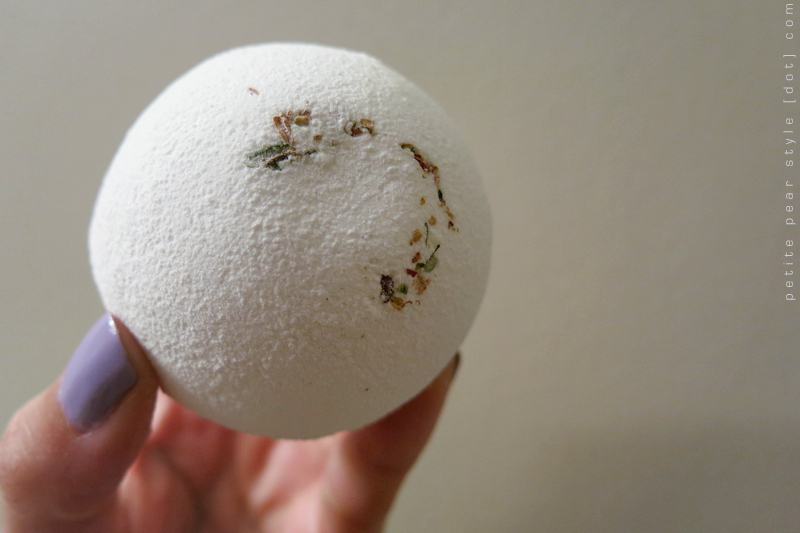 Thoughts: I really enjoyed this bath bomb! It was a great size and fizzed very nicely in the bath tub. I liked the light scent as well. Thoughts: I don't know why we have so many Asira samples - we must have stayed at one hotel a very long time to accumulate all these samples. I'm not a huge fan of these products so I wish we didn't have so many. Thoughts: I love the formulation of this whipped body creme - it's soft and creamy yet fast absorbing and non-greasy. The scent is very decadent (like chocolate cupcakes perhaps?) - while I do like the scent, I generally prefer fruity scents. Thoughts: This is my favourite eye cream. I'm not sure why it is called a serum because the texture is a thick cream. I noticed a difference in firmness in my under eye area the morning after using this cream. Yay for products that actually work! Source: June 2012 Glossybox - eeps, I probably had this product too long! Thoughts: Out of the sunscreens I've tried, this is my favourite formulation. It definitely has a "dry touch" and feels very matte and non-greasy. When I purchase a full size of this, however, I will probably buy the SPF 45 (I looked for SPF 30 but only found the mist formulation - which I actually have in my stockpile!). 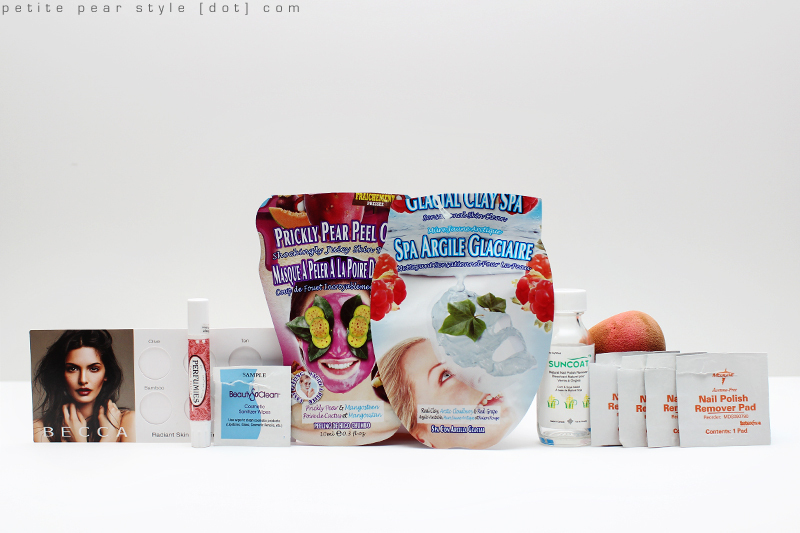 I also liked that it got a "Good" rating on the Paula's Choice Beautypedia - this website is my new obsession. Be sure to check out the Ingredient Dictionary too if you haven't already! Thoughts: I love everything about this cream! The texture is a medium weight but fast absorbing and non-greasy. My favourite aspect of this product is the scent - it is that perfect mix of fruity and floral. Thoughts: I liked the texture of this product - it was lightweight and provided just a touch of coverage (almost none) that was fine for my daily use for work. Unfortunately, this product is full of shimmer! I didn't notice it on my face but it was all over my hands. That is a deal breaker for me as I prefer non-shimmery face products. I feel like this product lasted forever (I was sure I had it for over a year), but it looks like I only received it in December 2012. Thoughts: I thought this cream was ok (medium weight, non-greasy), but there are other night creams I prefer - namely, the Perricone MD Face Finishing Moisturizer and the Befine Night Cream (website is down). Source: Sent to me by Lisa - thank you! Thoughts: I liked trying this sample but didn't notice that it did anything for my eye area. Thoughts: This cleanser was ok for me. It is a very thick and viscous formulation. It was also very gentle. The only thing I didn't like about this was the flavour! For some reason, this cleanser got in my mouth every single time I used it - I haven't noticed that with any other cleansers before. 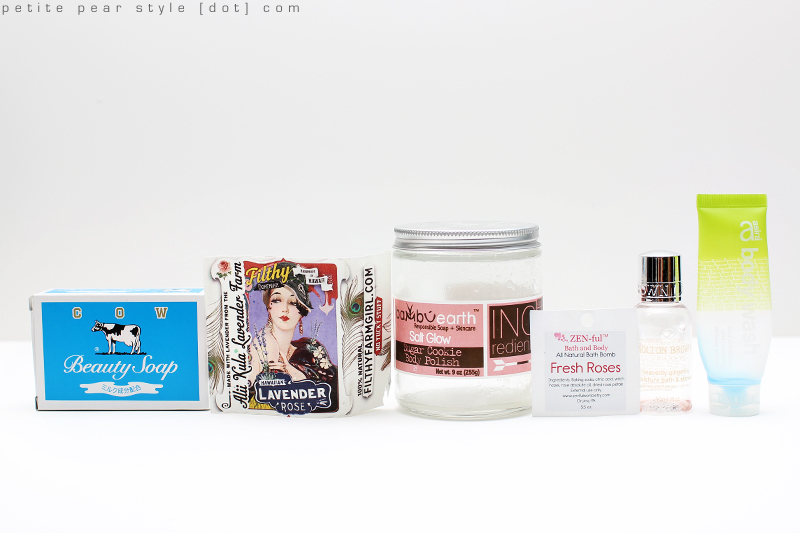 Thoughts: I really enjoyed trying this eye makeup remover! The cream formulation is very gentle yet effective. The only thing I don't like about this product is the high price. Thoughts: This makeup remover is very gentle, but I found it did not do a good job at removing my eye makeup when I had on heavy eyeliner and mascara. I liked this makeup remover, but it doesn't really have a place in my skincare routine. The only cleansers I need are (1) an eye makeup remover and (2) a non-abrasive cleanser to use with my Clarisonic Mia 2... which is alright because I find this product expensive for what it is. Thoughts: I thought this cleanser was ok - there wasn't really enough included in this sample for me to form an opinion on it. I didn't really like the scent of this product - it may have been the sage leaf but I found it a little too earthy/medicinal. Perhaps it is a more masculine scent than I am used to? Thoughts: These cotton pads are a staple in my beauty regimen. I like that they are soft and do not break apart. I currently purchase these at Shoppers Drug Mart for $9 a pack; however, if they increased in price, I would probably switch to a less expensive facial cotton as these are at my upper limit of what I would be willing to pay for cotton pads. 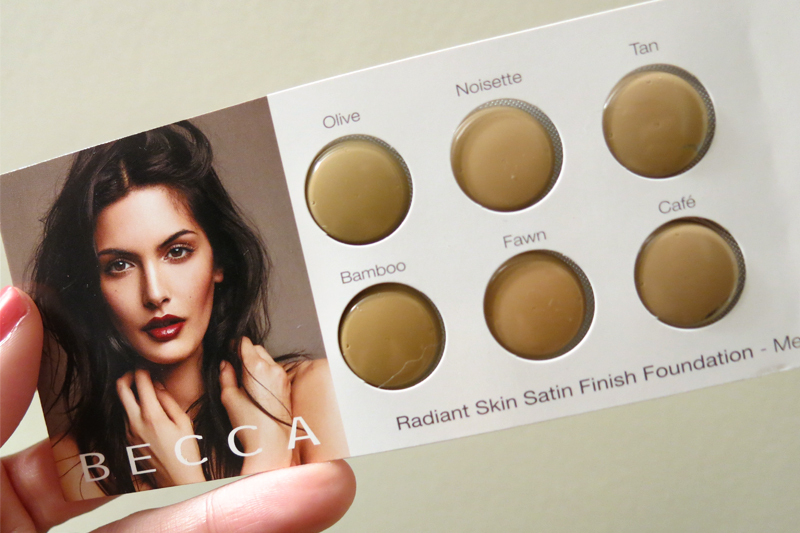 Thoughts: I received 6 shades in my set of medium samples; however, they were all too dark for my skin tone. I wanted to use these anyway so I mixed each one with my Revlon foundation (which is, incidentally, too light for me). Unfortunately, because I mixed the product, I wasn't able to really test out the texture or formulation. Thoughts: I loved everything about this perfume stick - it was soft and easy to apply. The scent was very floral, but I still liked it - the website identifies the components as roses, magnolia, gardenia, tuberose, and arris blossom. The stick format was very convenient to pop into my makeup bag so I was able to reapply this on the go. Based on my love for this product, I purchased a whole box of Perfumies sticks. I recently opened Buttercup but the texture is harder and more waxy. I'll have to test out a few more so I can report back on the "true" texture. Thoughts: I like using these sanitizer wipes to clean my tweezers and my makeup. Thoughts: I haven't tried a peel off mask in a long time so I really enjoyed this product. The mask itself is a translucent pink colour and is very sticky like Elmer's glue. I think I put on too thick of a layer in places because certain sections never dried but I still liked this mask. It was fun to use and it left my skin feeling very soft. Thoughts: I thought I would love this mask because it is a sheet mask infused in clay. Not only that but this product contains Glacial Clay - sourced from Canada’s Northwest Coast! The first thing I noticed when I opened this mask was the scent - unfortunately, I could not stand it as I found it nauseating. Hopefully, the other variations of the clay infused sheet masks are more to my liking as keeping this one on for 5-10 minutes was not easy and definitely not very spa-like. Thoughts: I was very intrigued by this product and was actually planning to buy it so I was thrilled when I received this in my Glymm bag. The first time I used it, I was sorely disappointed because this product did not take off my nail polish. Turns out I was using it incorrectly. To use this effectively, you have to leave the product on your nail for the oils to start working. I simply soaked a cotton pad and rubbed it quickly over each nail once. By the time I was done all 10 nails, I could go back to the first nail and start rubbing - it then worked very well at taking off my polish. I basically only used this for cream and slight shimmer polish as it is too gentle for chunkier glitter. Because this is an oil based remover, it leaves your hands very oily. I didn't like the scent of this product - still very harsh even though it is a natural product. This product is also very expensive for the amount you get. Thoughts: These nail polish remover pads work very well, but one is definitely not enough for all 10 nails as the website claims! I found I could use one pad for only 2 nails - the pads are tiny (and thin) so the nail polish remover evaporates very quickly. Thoughts: I love my beautyblender. It works so well at applying tinted moisturizer, BB cream, foundation, etc. The tip of mine broke off and it was starting to break down so I figured it was time to say goodbye. I have another beautyblender (mine came in a set of 2 with the cleanser) and I also purchased an imitation from Winners so I'm going to compare the two before I decide whether I would repurchase the original beautyblender. Thoughts: I'm not sure which cleansing cloths these are because I can't seem to find the pink container online. These wipes were ok - nothing too special. They did dry out a little bit but were still slightly moist despite me forgetting about them for a really long time. I like that you can buy refills for the container, but I likely will not be repurchasing this product. 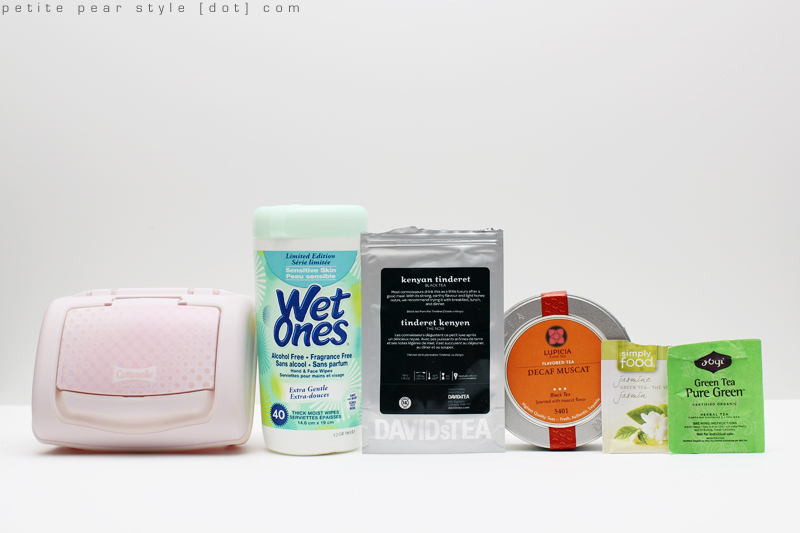 Thoughts: These are my favourite wipes! I use them for lots of different things like spot cleaning my makeup brushes, cleaning my shoes, cleaning my desk, wiping off my kitchen counter. The only thing I don't like about these wipes is that the dispenser doesn't work very well so I often just open up the tube and tear off a wipe. Despite opening the container all the time, I've never had these wipes dry out on me. Thoughts: This is a new favourite for me! I love this tea so much that I immediately ordered another bag (along with a bunch of other flavours) and had it shipped to my hotel in Chicago (unfortunately, Lupicia does not currently ship to Canada). This tea tastes so good with a little milk and honey - it tastes just like grape bubble tea but better, if that's even possible. I'm not sure if "flavours" in the ingredient list means natural or artificial, but I will try to find out and report back. Source: Tammy included this for me in a care package - thank you Tammy! Thoughts: I liked this tea as it was very light but wish that the jasmine flavour was more present. Thoughts: I remember thinking this tea was alright but don't remember much else about it... I should have taken notes! This was also a light tea, but I don't recall the flavour. My Bambu Earth scrub lost it's nice scent! I had opened it back in February when I got it, and then shut the lid and stored it under my bathroom sink until I needed it. I pulled it out the other day and discovered that now it has a horrible Chlorine smell! Maybe it got too warm under there or something, but I was so sad. The original smell was so good. I love these posts! They always motivate me to do it myself for the next month, but i'm too lazy! If you're considering a cheaper cotton pad, you can take a look at the cotton pads available at tnt supermarket. They have a few brands available, i prefer the japanese ones over the taiwanese one. If you need the 5 ply ones, you can check them out at the beauty store at jtown. 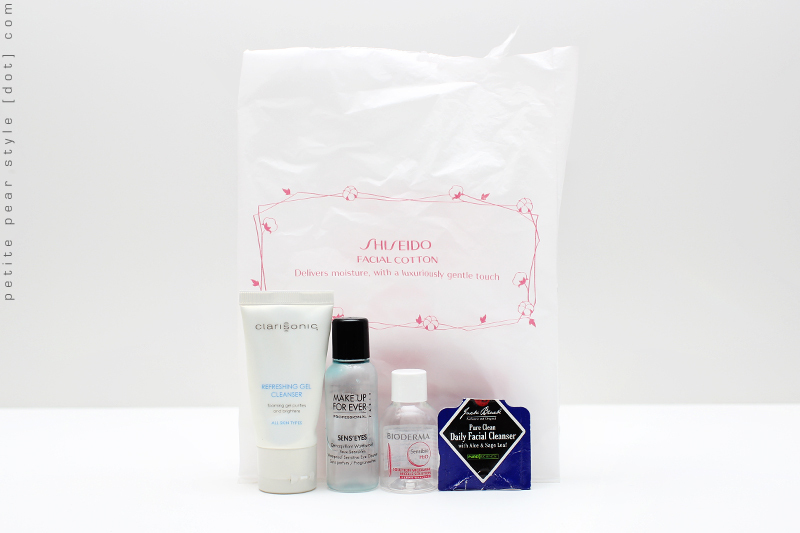 Decent quality but cheaper than the shiseido ones. They even have different types opened so you can feel them before you buy them. If you like perricone md products, there is a perricone md skincare set on sale at the shopping channel website that's of good value. I didnt like the vidal sassoon that much either! it made my ends feel nice but my hair got greasy the next day every time too. So many empties! Were these really all from june? I would need like a year to finish this many! You did so well! Wow!!! I bought the soy remover too and hated it, but I guess I just have to be patient! thanks jayne!! give the soy remover another try... but it only works well with cream polishes and your hands will be super greasy afterward. Hey girl, just so you know that Jack Black product is for men (so are all the other products by the same brand) and it's probably why you didn't enjoy the scent all too much. I LOVE the scent of the shaving cream (men's free birthday gift - my boyfriend got it from Sephora this month). 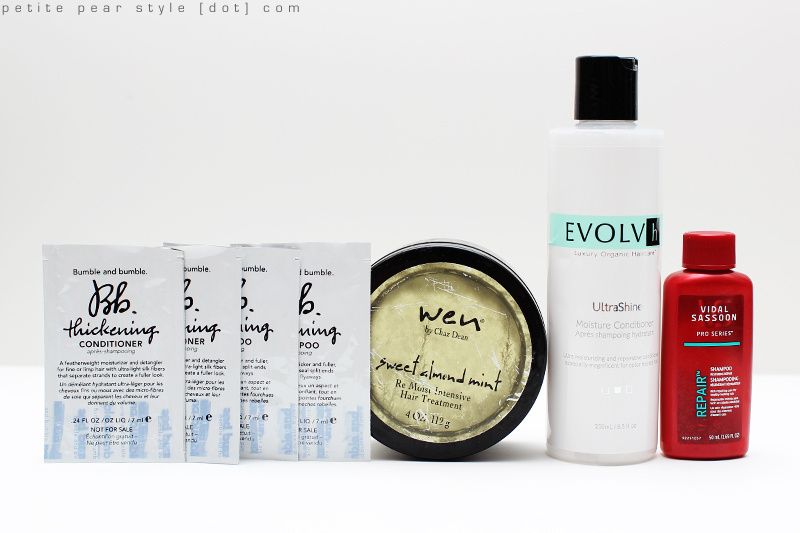 Great empties post there are so many things I want to go out and try! thanks meaghan! i've purchased a few of the jack black products for my hubby in the past so i realize the brand it targeted to men... i was surprised i didn't like the scent as i usually like masculine scents... maybe the sage leaf was too herbal... i dunno! i should tell my hubby to start going to sephora so he can get his birthday gift... i think it's too late for this year because his birthday was in february, but maybe some sales associates would still them out...?